The Fourth of July can be a dangerous holiday when adults and children are injured by defective fireworks. Unfortunately, poorly designed or manufactured fireworks can explode at the wrong time, sending children and adults to hospital emergency rooms. Homes or businesses can be damaged or destroyed by fires caused by fireworks. 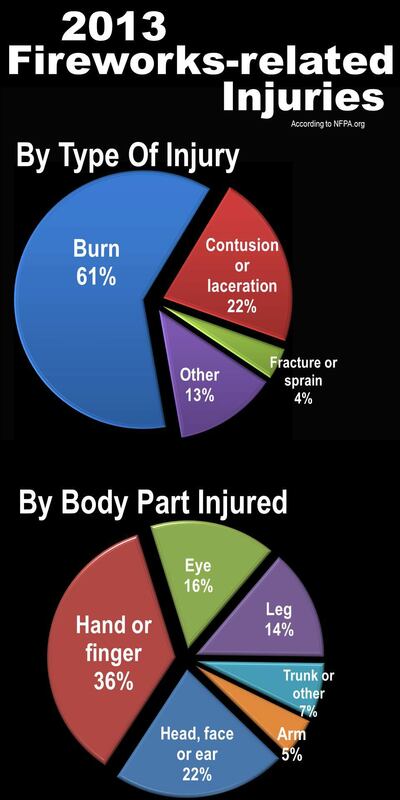 According to the National Fire Protection Association, in 2013 61 percent of fireworks-related injuries were burns, 22 percent were lacerations or contusions, four percent were fractures or sprains, and 13 percent were another type of injury. For the same year, 36 percent of the injuries were to a hand or finger; 22 percent were to the head, face or ear; 16 percent were to the eye area; 14 percent were to legs; 7 percent were to the trunk or other and five percent was to the arm. If you or your child been injured by fireworks, email the personal injury attorneys at Carr & Carr or call 1-877-392-4878. We have experience helping families when a loved one has been injured by fireworks. Manufacturers, distributors or other entities involved in selling dangerous, faulty fireworks may be liable for the injuries and damages caused to your family. Let the experienced attorneys at Carr & Carr help you decide if legal action is the best step for your family.